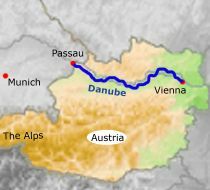 In brief: The Danube is Europe's second longest river and an important waterway. Today, more and more cyclists are using the river’s former tow paths to explore the continent and its various cultures. It is about 150 miles from Passau, Germany to Vienna, Austria’s capital. Your journey leads you through changing landscape, from densely forested hillsides in the Donauleiten nature reserve to the sun-kissed vineyards of the Wachau region. You will get to know the area's delicacies at first hand – the world’s oldest known torte in Linz, the fine wines of the Wachau region and the exquisite coffee at Vienna’s coffee houses. The route itself mostly follows the river on dedicated cycle paths or light-traffic back roads. Your guide ensures that you travel safely and are looked after carefully.